This post features three snap previews for Saturday’s order of play on Day 6 of the 2017 Wimbledon Championships including Caroline Wozniacki vs. Anett Kontaveit, Agnieszka Radwanska vs. Timea Bacsinszky and CoCo Vandeweghe vs. Alison Riske. For a recap of second round action from the top half of the women’s draw on Thursday, check out a bumper Set Points recap HERE. Blockbuster match-up alert… the number five seed and Eastbourne finalist, Caroline Wozniacki will face a stern test of her title credentials against the world number 38, Anett Kontaveit. The Estonian player is enjoying a breakthrough year on the tour and is unbeaten on grass in 2017 having won her first WTA title in ‘s-Hertogenbosch in the first week of this year’s grass court season. After winning the title, Kontaveit then had two weeks off from competition. This hasn’t affected her momentum though as she has won her first two matches in straight sets – Kontaveit beat Lara Arruabarrena in the first round, 6-2 6-4 and then delivered a brutal display of hitting to take out the number 29 seed, Daria Kasatkina, 6-3 6-2. Wozniacki beat the darkness for a good win over Tsvetana Pironkova on No.2 Court, 6-3 6-4. It’s always difficult when the weather or conditions are closing in but Wozniacki managed to maintain her focus and finish off the match. 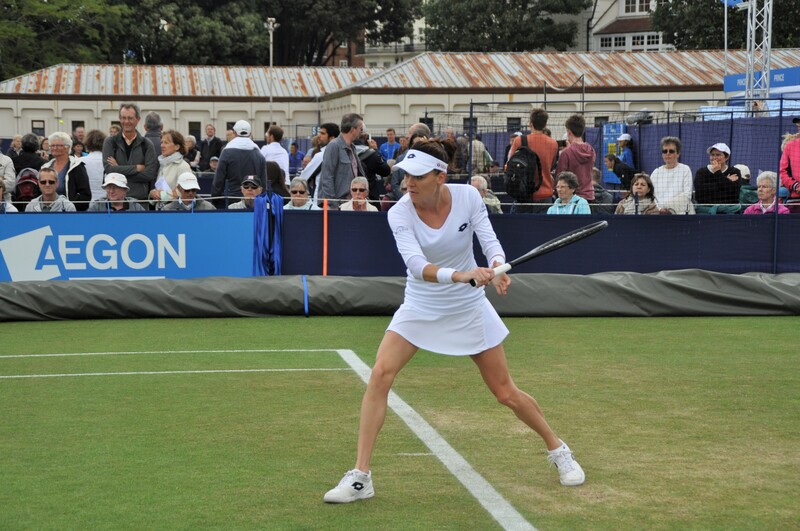 Pironkova had heavy strapping on her shoulder and leg, but still contributed to what was a superb contest. Wozniacki played some fine tennis and was hitting the ball especially well, a positive sign that she is feeling fit and healthy. The pair have met once before with Kontaveit winning in Nottingham on grass last year, 6-7(5) 6-3 7-5 – Note that this was Wozniacki’s first tournament back last year after an ankle injury so that result should be treated with caution. Both players are competing at a much higher level in 2017. Kontaveit’s game is driven on a big serve and weighty groundstrokes, and right now, she has a mega amount of confidence. Wozniacki does tend to get passive against big hitters so it will be imperative for her to not just rely on defence. A tricky one with both playing so well – i’m going for Kontaveit. In the only all-seeded match (!) from the top half of the women’s draw, Agnieszka Radwanska will play Timea Bacsinszky for a place in the last 16. Radwanska has had a pretty dire year, bothered by a foot injury and then a virus, which forced her to withdraw from both ‘s-Hertogenbosch and Birmingham. The Polish player has battled hard to reach the third round and saved two match points to defeat Christina McHale, 5-7 7-6(7) 6-3. It was Radwanska’s sixth consecutive win over McHale, who broke new ground by winning a set. McHale had two match points in the second set tiebreak – Radwanska carefully maneuvered a series of volleys on the first, while McHale went into the net on the backhand with the second. Radwanska’s serve looked vulnerable at times, but she defended well behind it and posted much better stats at the net than in recent matches, winning 31 of 43 points (73%) coming forward. Bacsinszky has been in superb form through her first two rounds and beat Kristina Kucova, 6-1 6-0 in just 48 minutes on Thursday. The Swiss player has combined for 48 winners and 16 unforced errors through her first two matches and has dropped just 13 points on her serve! Perhaps surprisingly, Bacsinszky leads Radwanska, 3-0 in their head-to-head and won their most recent match in Miami last year, 2-6 6-4 6-2. I’ve always felt that Radwanska struggles against players with variety and this has been a match-up that has so far stumped her. There is no doubt though that this is Radwanska’s favourite surface. Bacsinszky’s performance level, form and confidence suggests she is the clear favourite to win this match and she is my pick. I will add though that following the WTA tour has taught me to never take anything for granted! An all-American match-up between two of the best grass courters on tour, CoCo Vandeweghe and Alison Riske, will be one to watch on Saturday. 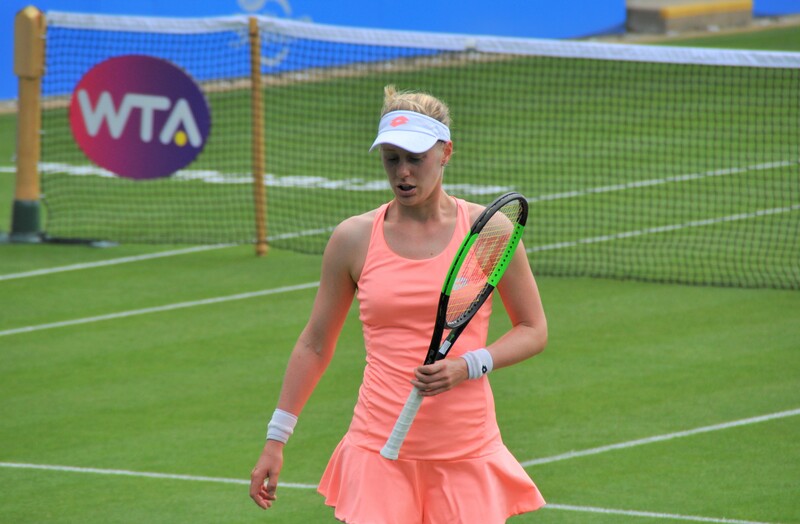 Riske caused an upset on Thursday, coming back from a set and a break down to beat Kristina Mladenovic, 2-6 6-4 6-4. Despite concerns about the court surface, the Frenchwoman looked to be sailing through with some fine tennis as her serve and backhand slice bamboozled Riske. However, Mladenovic seemed to lose her focus as a tenacious Riske, one of the best competitors on tour in my opinion, battled back into contention. In a close final set, Riske took advantage of a lapse service game from Mladenovic and then served out the match, trusting her game and finishing with two winners up at the net. Vandeweghe doesn’t seem to be showing any ill effects from the ankle injury she picked up in Birmingham and showed an improvement between the first and second rounds with a 6-4 6-2 victory over Tatjana Maria. This was a fine win because Maria is a dangerous player on grass and won the ITF tournament in Southsea the week before Wimbledon. Vandeweghe handled Maria’s slice-and-dice game handily, producing an array of impressive passing shot winners. Vandeweghe was very aggressive and won 24 of 29 points up at the net – she did not allow Maria to implement her game. While her first serve percentage was down at 49%, Vandeweghe was a perfect 25 out of 25 when she landed the first serve. In other matches, there is an all unseeded match between two comeback players, Petra Martic and Zarina Diyas, with a big opportunity in this draw! If Aga fights well, she has a chance, and I was pleased to see her fight in both of her matches so far. Bacsinzky is an extremely clever player, you can never guess what she is going to do next on the court, Radwanska will need all her strength – mental and physical tomorrow if she wants to have a chance. I think Aga underestimates Timea and that’s why Timea’s able to beat her. Timea’s just as *cerebral a player as Aga in my opinion but Aga doesn’t seem to have realised that yet, so Timea works out strategies to beat Aga without Aga doing the same back to her and (so far) always manages to win. When they last played in Miami, Timea realised that Aga likes to use the pace of her opponent’s shots to generate the pace for her own returns, so she hit a lot of high, looping balls with all the pace taken off so that Aga couldn’t do that. Coco vs Alison? Cat among the pigeons time: I think Coco is how Brits tend to think most Americans are; big, loud and brash, religious (she said yesterday she was going to pray for Bethanie, and I’m sure she meant it), patriotic in a way that puts down other countries (she famously said “I had 10 days left in Rome and I was bored so I went back to California instead!”) and competitive in a “my opponents are just obstacles on the way to the title” way. Alison’s pretty much the opposite (as is, say, Nicole Gibbs) and a reminder that that isn’t always true. I try not to dislike anybody in tennis but Coco does at times take more resolution than most; at her worst she can be like Kevin the Teenager in the Harry Enfield comedy series. Have to say though that when she’s playing well she has a beautiful game and her partnership with Pat Cash is certainly intriguing. I’ll bet she won’t treat him on court with the same disrespect she’s shown Craig in the past (he won’t let her). * Only with more power and (possibly) more mental fragillity and the last is why she doesn’t have the consistently high rankings she possibly could have. Nice analysis, Graham! I’m the same about disliking players but CoCo has pushed my buttons this year. Cannot deny she’s fab to watch on the grass though and could be one to watch come the second week. I think there was a bug with the Wimbledon app, the match hasn’t started yet! The current grass court shoes with their multitude of mini cleats appear to be ripping the grass courts to shreds. A change to a herringbone or Stan Smith shoe sole would be easier on the court but could result in less traction and possibly more slips and falls. Does The Moo have an opinion on changing the Wimbledon shoe sole design? To be honest, the Moo does not have much of an opinion or have expertise in the area shoe sole design! It has been concerning how the courts have deteriorated at Wimbledon this year. I recall how good the courts in both Birmingham and Eastbourne looked at the end of the week. I love people underestimate Riske again. Coco is a crazy horse and she hates to play a rally with a player like Riske. I am not surprised this is another upset again. Aga is not the same Aga 3 years ago. Timea will send her home. Aga or Timea… I fancy Sveta against either one of them, to be honest. Neither has a good h2h against Kuze.